This is a reflection written by James Archuleta in May 2018 and published on August 21st, 2018. James graduated from Northern Arizona University in summer 2018. 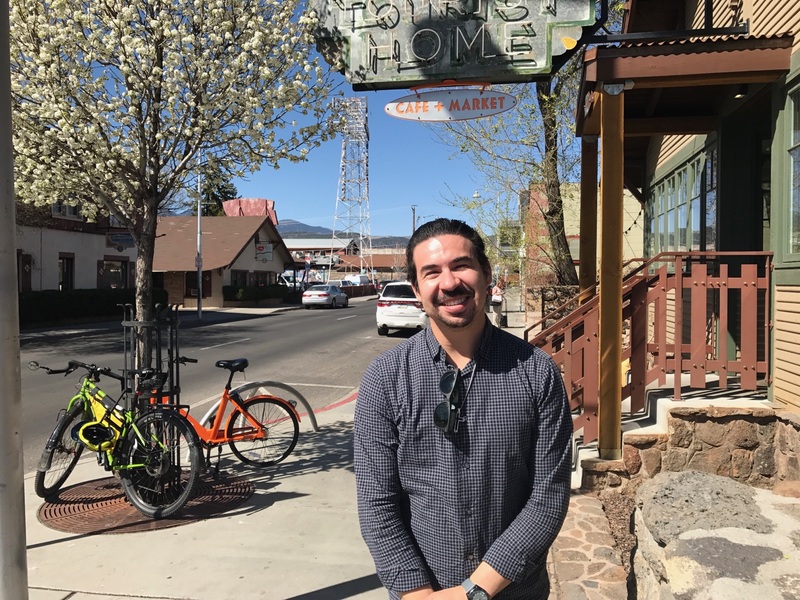 James Archuleta stands outside the Tourist Home, a historic structure in the Southside Neighborhood. My name is James Archuleta. I am a senior at Northern Arizona University majoring in political science with a minor in psychology. This spring, I worked as an intern with the Friends of the Rio de Flag on their Rio de Flag and Southside Neighborhood project funded by an EPA Environmental Justice Small grant. My internship focused on increasing community awareness about the history of the neighborhood and Rio flowing through it. My main tasks included: 1) building a social media campaign to provide our Facebook followers the chance to learn more about their local community, and; 2) canvassing along with staff from the Community Development section of the City of Flagstaff who are working to update the Southside Neighborhood Plan through resident-driven process and input. This door-to-door outreach allows us to collect information from residents about their experiences with flooding of the Rio de Flag and how they feel this issue should be addressed. This project is about education, outreach, and most importantly, building relationships with Southside Neighborhood residents in order to better understand their experiences. The Rio de Flag runs through the heart of the Southside Neighborhood (Figure 1). Like all rivers, the Rio de Flag has a floodplain, or area of low-lying ground adjacent to the river that is subject to flooding. Figure 1 shows the delineation of the Federal Emergency Management Agency’s “100-year floodplain” which encompasses a large section of the Southside. The area within a 100-year floodplain has 1 in 100 chance of flooding every year. Figure 1. 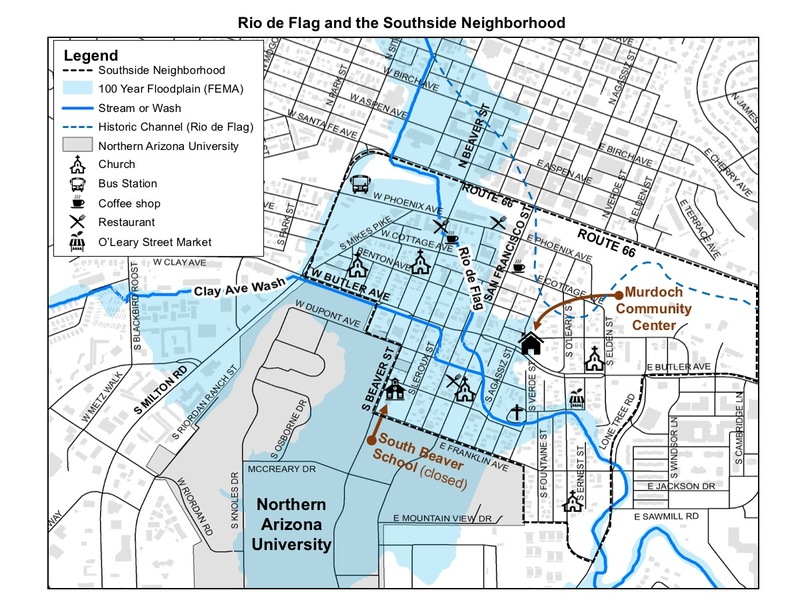 Rio de Flag flowing through Southside with FEMA designated 100-year floodplain. Pre-1920s channel shows Rio flowing along railroad alignment. This is problematic for the residents of the Southside Neighborhood, but it’s more complicated than that. Flooding in the Southside is a matter of environmental justice. Historically, the Southside Neighborhood was a segregated community. In the early 1900s, the Rio was diverted into the neighborhood. The new channel was built with insufficient space to carry small floods let alone a 100-year flood. This history put low income, minority families of the Southside Neighborhood at a disadvantage. Today, those multi-generational families still bear the burden of this diversion of flow. The residents of the Southside face a multitude of problems related to flooding. The designation of a FEMA 100-year in their neighborhood means that they have an added cost to their home ownership in the form of paying legally-required flood insurance. In addition, if Southside residents want to renovate their homes, they must follow what is known as the “50-50” rule. This FEMA rule means that residents are required to follow FEMA building requirements for any renovation that is equal to or greater than 50% of the value of the structure being renovated. Often times this means “building out of the floodplain” for such renovations, or literally raising the foundation of the structure above the height of the 100-year flood water levels. The thing is, if they don’t renovate, their properties are in the path of the waters if the Rio ever does flood. It’s a catch 22 situation: pay the high costs needed to renovate, or keep paying flood insurance and leave your property susceptible to damage by flooding. The City of Flagstaff has been trying to address this issue through a partnership with the U.S. Army Corps of Engineers. Their partnership, known as the Rio de Flag Flood Control Project, began in 1995. While parts of the project have been completed, but project design has yet to be completed, let alone the on-the-ground work needed to protect residents from a 100-year flood. In addition, over 20 years have passed since the Southside residents have been approached for their input on the project design. The work I carried out with the Friends of the Rio will give Southside residents a chance to share their insights. What do these residents want for the future of their neighborhood and river? What issues are they facing and what opportunities do they perceive? The burden of flooding ultimately falls on the Southside residents. Their livelihoods and their businesses are those that would be directly affected if a flood were to hit. They are the ones who will directly deal with having to clean up, move, or deal with the destruction of their personal belongings. Their voices need to be heard and collecting their input and engaging them in the process is a step in the right direction to addressing the problem of flooding. Matt Muchna, the Friends of the Rio’s Education and Outreach Project Manager, illustrated an important point about natural disasters: they illuminate and exacerbate social problems that are already in place before the disaster hits. “Social floods” disproportionally affect minorities and low-income communities after a natural flooding disaster strikes. If you have the means and are wealthy, the disaster is tough to deal with, but isn’t anything that can’t be solved with a little time. On the other hand, if you do not have the means, then you end up stranded on a roof top, waiting for help, trying to figure out the stress of how you’re going to get your life back together, paired with the stress of the fact that your life is in danger, and you need supplies and other necessities to stay alive. Flood disasters hold at risk communities back. For that very reason, finding a solution to potential flooding is important because those pre-disaster inequalities can be rectified; proactive plans can be made. Floods never have to be a problem if the area is properly prepared and managed to handle large water flows without community flooding. Flood planning and prevention matters because it helps everybody out, not just those at risk. It helps keep those inequalities from becoming worse and it allows people focus on the day to day needs that are important. It enables residents to receive the proper payment for their homes and properties, enables renovations, and provides them with a little peace of mind that does not often exist when living in a vulnerable community. Thank you to James for his dedication to community and eagerness to always keep learning! Best wishes in life’s next journey.